Beckman Coulter Cell Lab Quanta SC Flow Cytometer 3-Color Volume Software . New Life Scientific, Inc. 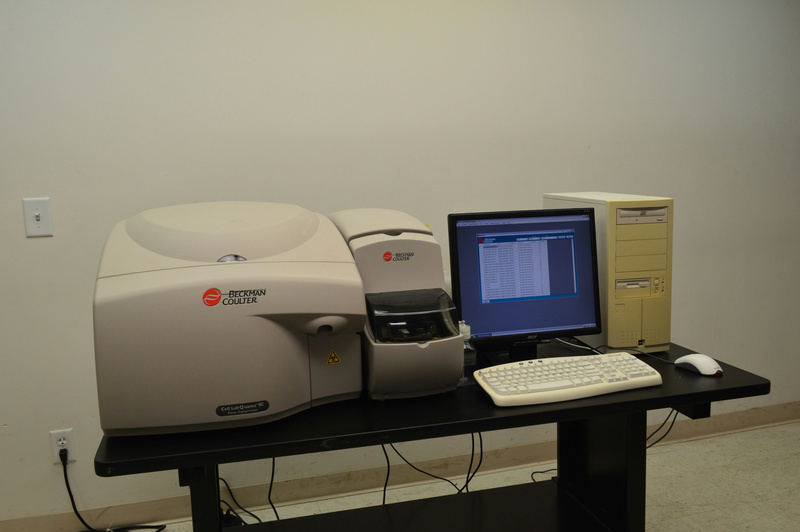 The Beckman Coulter Quanta SC Flow Cytometer is in need of extensive repairs and will be sold for parts/as-is. The cosmetic condition of the instrument is good, but full functionality cannot be verified. The instrument powers on, initializes, and the software opens and reports back without issue. The glass capillary broke off into the flow cell and there is glass lodged within. A new capillary will need to be purchased after removing the glass pieces. The system will not be sold with a laser power source attached. Several minor repairs may need to occur before operation such as, but not limited to, the replacement of screws. New Life Scientific technicians were able to pull liquids out of it and initialize pumping, but without the capillary no further testing was performed. Currently, the full extent of the damage cannot be determined, but this is an excellent opportunity for the right repair service or technician to acquire a valuable instrument. Included with purchase is a computer with the software, monitor, keyboard, and mouse. The software version is Cell Lab Quanta SC Software v. 1.0. A fully functional flow cytometer uses the Coulter Principle for cell sizing and counting, a method renowned for its precision and the ability to remain unaffected by shape, color, or refractive index. There are violet to red filters optimized for fluorescent measurements. All live and dead cells can be differentiated with both propidium iodide and 7-aminoactinomycin D.
A datasheet from the manufacturer can be found here. While New Life Scientific takes many steps to ensure that our instruments are in perfect working order we cannot ensure that all products are up to manufacturer specifications. We recommend every product undergo professional installation and calibration before use in research, production, and clinical applications. For this reason, we offer a 30-day warranty on all of our working products in the interest of maximum customer satisfaction. Please contact us if you have any questions regarding this item or if you would like us to send more pictures of it. Additionally, we are willing to perform any tests or examinations you may request in order to better determine the condition of the product. Simply contact us with detailed instructions.